THE DARK TOWER GUNSLINGER 4: WAY STATION. 2019 Hardcover Edition. Signed bookplate by Robin Furth! Free Acid FreeBook Cover Included! OVERVIEW: Rolands pursuit of the elusive Man in Black across the endless Mohaine desert becomes even more treacherous when he is attacked by a ravenous pack of desert dogs and vampiric dust devils when he is at his weakest! Its the start of a new chapter in the life of the last gunslinger of Gilead as he struggles to remain alive andachieve his destiny! Dont miss the wonders of: The Way Station! 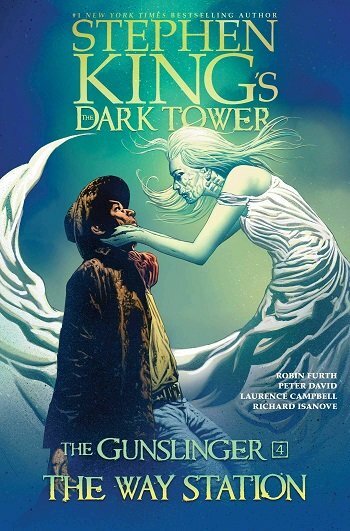 This edition includes all issues in DARK TOWER: THE GUNSLINGER THE WAY STATION #1 5. 2019 Gallery 13 Hardcover. New. New and covered for complete archival protection. 128 pages. This product will be in stock on 05/07/2019.